Europe is in the grip of tough austerity measures - some of the deepest public sector cuts for a generation. The colossal debts and of eurozone "periphery" nations - especially Greece, Italy and Spain - have hammered market confidence. The interest rates (yields) on their sovereign bonds have soared, making it hard or even impossible for them to borrow in international markets. Greece, the Republic of Ireland and Portugal have all received massive bailouts from the EU and International Monetary Fund (IMF). The 27 EU member states aim to cut deficits to a maximum of 3% of GDP by the financial year 2014-15, so what belt-tightening measures are the countries taking? Greece is the biggest worry for the EU, after elections on 6 May produced a surge in support for parties opposed to the tough austerity conditions attached to the country's bailout. There is now great uncertainty about Greece's ability to fulfil its austerity pledges and much speculation about a possible Greek exit from the eurozone. The left-wing bloc Syriza, which came second in the inconclusive election, looks poised to do well again in new elections on 17 June. It has vowed to tear up the bailout agreement - yet insists that Greece should keep the euro. The previous technocratic government of Lucas Papademos negotiated a second massive bailout for Greece, worth 130bn euros (£110bn; $173bn). It took months of difficult talks with international lenders before a deal was reached in March. In the largest restructuring of government debt in history, lenders and banks wiped 105bn euros ($138bn, £88bn) off Greece's debt burden. But in order to receive the new bailout, the Papademos government committed Greece to far-reaching spending cuts, equal to 1.5% of its output. Greece has now been in recession for five years. 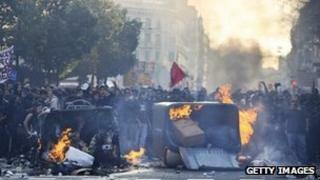 The cuts proved deeply unpopular with the Greek people, leading to a wave of protests and crippling strikes. To make the economy more competitive Greece pledged to cut the minimum wage and make labour markets more flexible, weakening job security. The aim is to cut the Greek government's debt from 160% of GDP to a little over 120% of GDP by 2020. The more unpopular austerity measures include a new property tax and the suspension of 30,000 civil servants on partial pay. Many Greeks feel the credit terms are intolerable, condemning the country to years of painful cuts and job losses. The unemployment rate has risen to 22%. Greece remains frozen out of international credit markets because its sovereign debt has junk status. This year Italy has slid further into recession - its steepest economic contraction for three years. The crisis toppled the veteran leader who dominated Italian politics for two decades - Silvio Berlusconi. The immediate trigger for his downfall was Italy's soaring bond yields - they entered the 7% danger zone, generally regarded as unsustainable. The markets are still jittery about Italy's public debt, which rose to abound 1.9 trillion euros (approximately 120% of GDP) at the end of 2011. A former EU commissioner, Mario Monti, replaced Mr Berlusconi with a promise to get Italy's economy back on track. The Berlusconi government had already adopted an austerity package in July 2011, featuring savings worth 70bn euros. It included increases in healthcare fees, and cuts to regional subsidies, family tax benefits and the pensions of high earners. Mr Monti's administration has pushed through further austerity measures, including higher taxes for the wealthy, a rise in pension ages and a major drive to tackle tax evasion. The government aims to cut public spending by 4.2bn euros this year. Italy has been cutting public sector pay and freezing new recruitment. Only one employee will be replaced for every five who leave. The government is currently locked in a dispute with unions over labour market reforms. The changes - supported by the EU - would make it easier to sack staff. The IMF signed off on a 3.9bn euros (£3.2bn) tranche of loans to Ireland in December 2011, following on from a EU/IMF bailout worth 85bn euros a year earlier. In July 2011, EU leaders agreed to a request from the new government of Enda Kenny to lower the interest rate from around 6% to between 3.5% and 4%. The length of time to pay back the loan was also extended from seven-and-a-half years to 15 years. The toughest budget in the nation's history included a pledge to trim the deficit by 6bn euros in 2011. Government spending has been slashed by 4bn euros, with all public servants' pay cut by at least 5% and social welfare reduced. VAT rose to 23% as child benefit was cut and police stations were closed. The government aims to cut public service pay by 400m euros in 2012. Ireland's economy shrank by almost 2% in the third quarter of 2011, compared with growth of 1.4% in the previous quarter. In May 2011 Portugal became the third eurozone country to receive a huge EU/IMF bailout - 78bn euros. A new centre-right coalition government took office with a big enough majority to pass the austerity measures necessary under the bailout conditions. The previous minority Socialist government fell after failing to get opposition backing for a new austerity package. The new government adopted a range of austerity measures, including a 5% pay cut for top earners in the public sector, a VAT rise of 1% and income tax hikes for high-earners. The military budget is being slashed and two high-speed rail projects have been postponed. There has also been widespread privatisation, and unemployment rose to 14.8% in January 2012. In March, public sector workers staged their second strike in four months to protest against the measures. Unemployment in Spain has soared to nearly 25% - the highest rate in the EU - and for young people under 25 the rate is above 50%. The new conservative government of Prime Minister Mariano Rajoy plans to cut 27bn euros from the state budget this year - one of the toughest austerity drives in modern Spain's history. Changes will include freezing public sector workers' salaries and reducing departmental budgets by 16.9%. Health and education are among the areas hit. The cuts are aimed at meeting the new deficit target agreed with the EU Commission: 5.3% of output (GDP) this year. Spain had already passed an austerity budget in 2011 which included tax rises for the rich, a 28% increase in the tax on tobacco and 8% spending cuts. Spain has seen , with makeshift tent cities organised by young people who fear a bleak, jobless future. A general strike was held ahead of the new budget in March and hundreds of thousands of people turned out on the streets to protest against austerity measures . At the start of its term in 2010, the Conservative-Liberal Democrat coalition government announced the biggest cuts in state spending since World War II . Savings estimated at about £83bn are to be made over four years. The plan is to cut 490,000 public sector jobs. Most Whitehall departments face budget cuts of 19% on average. The retirement age is to rise from 65 to 66 by 2020. The budget deficit is about 10% of GDP and unemployment - officially 2.67 million (8.4%). That is its highest level since 1994. In the 2012 budget, Chancellor George Osborne announced several measures to ease taxes - including a 5% cut to the top rate of tax and a rise in the personal income tax allowance threshold. However, he also cut the personal income tax allowance pensioners receive, reduced child benefit and raised taxes on tobacco and other items. Public anger over the cuts has grown. More than 250,000 people demonstrated in London in March 2011 - the city's biggest protest since the 2003 Iraq war. Protest camps sprang up in cities across the UK towards the end of 2011, echoing similar "occupy" sit-ins around the world. France's new Socialist President, Francois Hollande, has made it clear he aims to shift the EU's emphasis away from austerity and towards growth. Controversially he says he wants to renegotiate the EU's fiscal pact - already agreed by 25 nations - to include measures to stimulate growth. In the run-up to his victory on 6 May he promised to increase taxes on big corporations and people earning more than 1m euros a year. He wants to raise the minimum wage, hire 60,000 more teachers and lower the retirement age from 62 to 60 for some workers. The previous centre-right government of Nicolas Sarkozy announced plans for 65bn euros of savings by 2016 , including closing tax loopholes and withdrawing temporary economic stimulus measures. Mr Hollande is also committed to balancing France's budget, but a year later than Mr Sarkozy - in 2017. Germany's economy is doing better than most in Europe. It grew by 3% in 2011 and its growth of 0.5% in the first three months of 2012 was stronger than expected. The German performance - largely a result of strong exports - meant the eurozone as a whole narrowly avoided returning to recession. German unemployment in April was 7% - the lowest rate in more than 20 years. The government plans to cut the budget deficit by a record 80bn euros by 2014. The plans include a cut in subsidies to parents, 10,000 government job cuts over four years, and higher taxes on nuclear power.